LSU preview: Are Tigers that tough, or is the drama being invented? 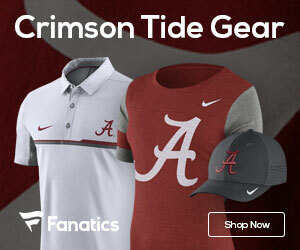 | TideFans.com | By the Fans, For the Fans. LSU preview: Are Tigers that tough, or is the drama being invented? College football’s version of a “Fake News” hashtag in recent seasons has mostly revolved around the sports media’s coverage of various “games of the century” involving Alabama. While a handful have certainly met the definition, most of the time Alabama has won, and won comfortably. Pundits looking for nail-biters and getting blowouts instead tend to slowly step backward until they disappear behind the theater curtains, stage rear. This year, it’s no different. Louisville was supposed to be the big test. Then it turned into Ole Miss. Then it was Texas A&M. Then Drew Lock and Missouri. At the same time the media was gasping for any air that wasn’t Tidally-tinged, LSU began its improbable run to what has become the No. 3 ranking in the country. The Tigers began by throttling a Miami team many (including this writer) picked to beat them, although Miami has since proven to be less than what anyone thought they’d be. If the radar wasn’t blipping by then, a 22-21 last-second victory over Auburn in Jordan-Hare Stadium certainly did the trick. Again, however, LSU’s opponent has since proven itself to be not worthy of the hype. An 8-point loss to Florida three weeks later threatened to quell all good vibes, but then came Georgia and its Oprah Winfrey approach to ball security – you get a turnover, and you get a turnover, and you get a turnover – and suddenly LSU is the Pittsburgh Steelers of the 1970s again. A 19-3 win over Mississippi State didn’t excite anyone, but it did continue to cement LSU’s growing reputation as a physical team. So now it’s about Alabama, and Alabama’s nation-leading, 54.1 points-per-game offense, and quarterback Tua Tagovailoa, whose worst performance in any outing lasting two quarters or more was the one he dropped on Georgia last January with a national championship on the line. His worst. Is this matchup for real? Is LSU capable of slowing Tagovailoa down? What is reality for the LSU offense – is it the 36 points scored against Georgia, or is it the 19 put up against Mississippi State and Florida? LSU’s best output of the season – 45 points against defense-illiterate Ole Miss – ties for Alabama’s second-lowest of the season, a win over Texas A&M that left some people wondering what was wrong with Bama football. Because if this matchup isn’t for real – if it’s just another media creation looking for salvation from the inevitable – then who on Alabama’s schedule will be? Mississippi State could actually be a tougher matchup for Alabama offensively, especially if Nick Fitzgerald is having a good night, and the State DL is good, but the receivers are limited and finding a Bulldog you could label “dynamic” likely means changing the particular group of Bulldogs you’re inspecting. Auburn, presuming it hasn’t quit, is almost always a tough out for Alabama, and for Nick Saban in particular. Georgia? Well, they just lost by 20 to the same LSU team we’re discussing right now. That might mean Alabama won’t see a real challenge until not just the first, but the second – championship – round of the College Football Playoff. LSU loses this game and it will not make the playoff, that much is assured. If the rest of the current landscape goes chalk, Alabama likely ends up playing a Michigan team in the semis that is going to have significant issues matching Bama’s speed. Then it’s probably the rubber game of Bama’s bridge battle with Dabo Swinney. 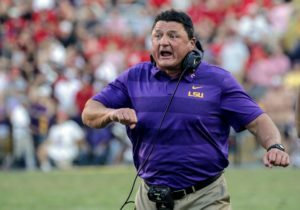 Having said all that, Ed Orgeron deserves due praise for getting his Tigers to play with self-belief, either because he’s just a great tactician … ahem … or his players are just scared he’ll eat them instead of the stadium grass if they mess up. But all the bayou-flavored platitudes won’t help the Tigers if they turn out to be of the paper variety. LSU dispatched with Matt Canada as offensive coordinator, but kept many of his schemes and systems. Orgeron reportedly felt more comfortable with veteran SEC assistant Steve Ensminger running things. While the win-loss results have been better, the productivity has not been. LSU is down – significantly, in some cases – in all major offensive categories compared to 2017. The Tigers are 86th in total offense, 101st in passing offense, 107th in passing efficiency and 60th in scoring offense. Rushing offense is the highlight, but it’s still outside the top forty (43rd). The one thing the Tigers do well is come out roses in the turnover battle, ranking 9th in fewest interceptions thrown, but the defense has covered up some fumbling issues among the skill positions by being prolific at takeaways. This is a pro-style offense with a focus on trying to get undisciplined defenses on their heels, but so far the results against SEC teams have been mixed at best. Alabama counters with its pro/spread mash-up that leads in the nation in scoring, passing efficiency and third-down offense, is 2nd in total offense, 5th in passing and 30th in rushing. On paper, it’s a mismatch. There’s no use piling more praise onto Bama’s Tua Tagovailoa, so let’s try to break down Joe Burrow’s game instead. Burrow has mediocre passing stats – 120 of 223 (53.8%) for 1,544 yards, 6 touchdowns and 3 interceptions. His willingness to be patient rather than forcing throws into defenses is admirable, but he’s averaging 6.9 yards per attempt and can’t stretch defenses. Surprisingly, his rushing stats are significant: 67 carries for 250 yards (3.7 avg. ), which includes yardage lost to sacks, and 4 touchdowns. That’s double the output of Alabama’s Tagovailoa on the year. The numbers look even better when you consider LSU has trouble limiting sacks, so with sack yardage coming off Burrow’s rushing totals, he’s probably more dynamic than you might think. He’s also taken every snap under center for LSU this year, which has ramifications not just for durability but also what happens if he gets hurt. The backup, Myles Brennan, came into the year with very little experience and hasn’t gotten additional work. Nick Brossette has scored 10 touchdowns on the year for LSU but he isn’t the kind of playmaker Leonard Fournette or Derrius Guice were. He’s a role player starting out of necessity, with an average YPC of 4.6, low for this offense. Sophomore Clyde Edwards-Helaire has arguably flashed more in the chances he’s gotten. He’s a good bit shorter than Brossette but the same weight, and can expose bad tackling technique. After these two, there’s really no one else besides Joe Burrow; third-team RB Lanard Fournette has just 3 carries on the season. Alabama will use three running backs in a rotation, Damien Harris, Najee Harris and Josh Jacobs. Bama’s three and LSU’s top two have roughly the same total yardage on the year, but Alabama carries for more yards per rush and Bama’s backs are more dangerous as receivers. A fourth Tider, Brian Robinson Jr., is as talented as the top three and has put up good numbers when given the opportunity. LSU has had some fantastic talent at wide receiver over the years that has suffered through poor quarterback play, and 2018 is no exception. Justin Jefferson has been the breakout star in 2018, more than doubling up the production of his nearest teammate. Jefferson has caught 30 passes for 471 yards (15.3 avg.) but only 2 touchdowns, which is more on Joe Burrow than him. Jefferson has above-average height but isn’t really a stout receiver. The other starting position has rotated between Stephen Sullivan, Dee Anderson, Jonathan Giles, Terrace Marshall and Derrick Dillon, and LSU, like most other teams these days, will go three-wide more often than not. When Sullivan and Anderson are on the field, it’s basically a basketball game – both are 6’6” and in excess of 225 pounds. Marshall hits 6’3” and 200. Starting tight end Foster Moreau has developed into a reliable option but he plays primarily because of his blocking. Alabama will counter with Jerry Jeudy, Henry Ruggs III, Jaylen Waddle and, back again this week, DeVonta Smith. There are 23 touchdowns among this group with a per-catch average around the 20-yard mark. For pure explosiveness, it’s hard make an argument against Alabama in any setting. Adding to the chaos is tight end Irv Smith Jr., who has nearly 400 yards on the year, 5 touchdowns and is averaging 17.5 yards per catch while being a devastating blocker in the running game. Smith has also lined up at receiver and fullback. The move of Deonte Brown into the starting left guard role looks like it just might stick. Bama had a different look in the running game against Tennessee with Brown there, although Lester Cotton, the player he replaced, is a better pass blocker. Ross Pierschbacher will start at center, Alex Leatherwood at right guard and Jonah Williams and Jedrick Wills will be the tackles. Alabama is 8th in the country in tackles for loss allowed and 3rd in sacks allowed, so there’s really no concern here outside of in-game health. This isn’t a vintage year for LSU’s offensive line, as the Tigers are 63rd in tackles for loss allowed and 76th in sacks given up. The starting lineup has changed frequently. As it stands now, only center Lloyd Cushenberry, a sophomore in his first year as a starter, and right guard Damien Lewis, a red-chip JUCO transfer, have started every game. Saahdiq Charles has been the on-again, off-again starter at left tackle and will start there Saturday. Austin Deculus has started all but one of the games at right tackle.